The robot apocalypse may not be here just yet, but we hear that phase one starts with robots that are able to climb walls. If that's the case, then we're one step closer to The Matrix Revolutions than I care to think about. 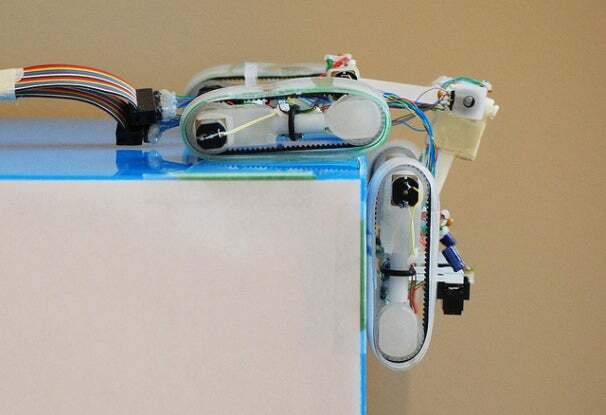 Simon Fraser University (SFU) researchers have created a robot Gecko that can climb walls using an adhesive that mimics real gecko feet. Translation: We're pretty much screwed. The SFU gecko can currently climb at 3.4 centimeters a second, using hundreds of silicon bumps just 0.017 millimeters wide and 0.01mm high to tread surfaces. Right now, real-life applications for this include having these nifty little robots clinging to the sides of skyscrapers and to the inside of nuclear power plant chimneys, but down the road, who knows? I can't help but wonder how long it will take before an assassination gecko is hanging out on my roof waiting for me to sleep at night. The Vancouver Sun's story includes some additional information, including quotes from lead researcher Jeff Krahn. The gecko bot is thankfully still in a prototyping stage, but we're sure it's only a matter of time until they get military funding and outfit this robot with death inducing chemicals... I'm just saying. What's worse is that some of Krahn's colleague are working on a spider to do the same thing. Oh man, I'm sure there's an 1980s horror movie with B-list actors in here somewhere.